Coordinated Freedom for Nestora protests were held at the Mexican Consulates on Dec. 10, 2013 in Seattle, Portland, San Francisco, Los Angeles, and New York City. Actions were also seen internationally in Melbourne and Costa Rica. Nestora’s daughter Grisel speaks to the press. Protest signs at the Seattle rally. Radical Women’s Ann Rodgers, Nestora’s daughter Ruby and her husband, José at the Seattle protest. Protesters at the NYC rally. 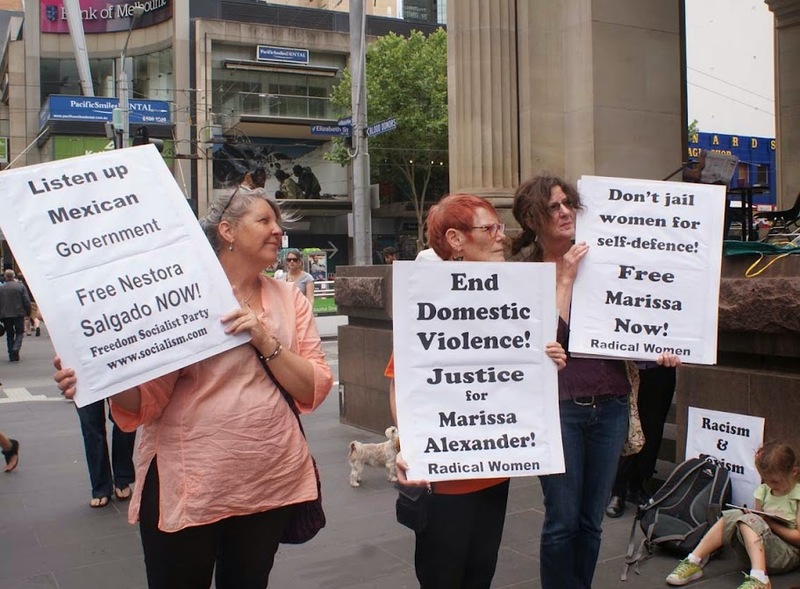 Protesters in Melbourne speak up for Nestora and other female political prisoners. Protester speaking at the San Francisco rally. Protesters at the Los Angeles rally. 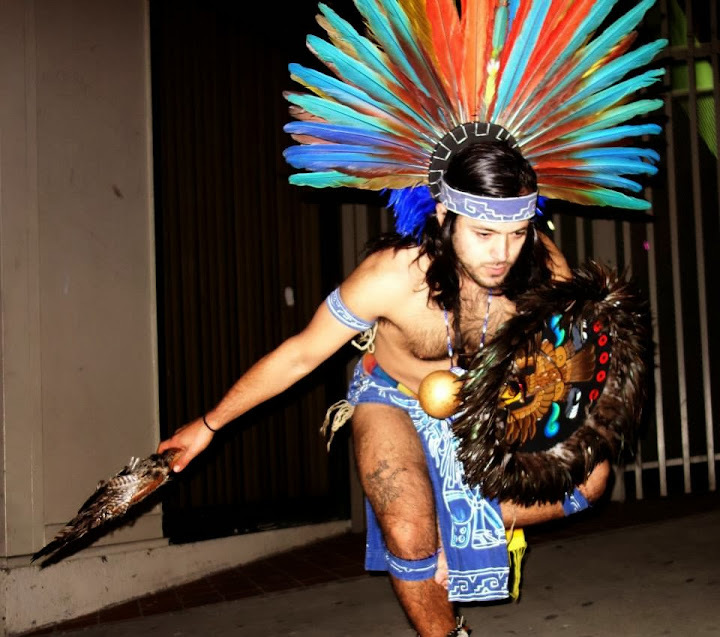 A protester performs at the Los Angeles rally. 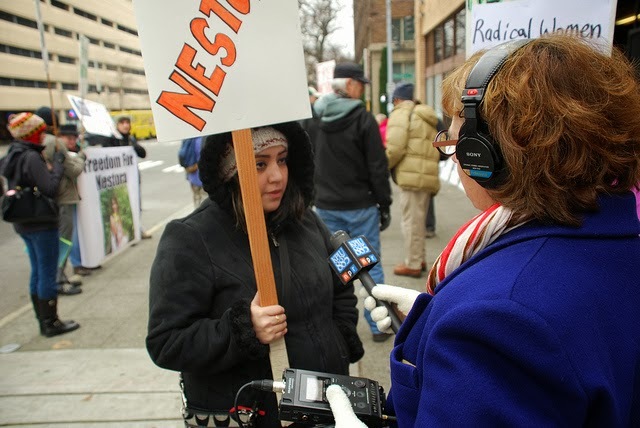 Video of the Freedom for Nestora Protest in Seattle, WA on Dec. 10, 2013. Speeches by her husband, José Luis Avila, and daughter, Grisel Rodriguez, along with other supporters of the campaign. Speeches from the protest in NYC. This article originally appeared on socialism.com. “Free Nestora Salgado” solidarity rallies were held in Los Angeles; San Francisco; Seattle; New York City; Portland, Oregon; Mexico City; Santo Domingo, Dominican Republic; and Melbourne, Australia. 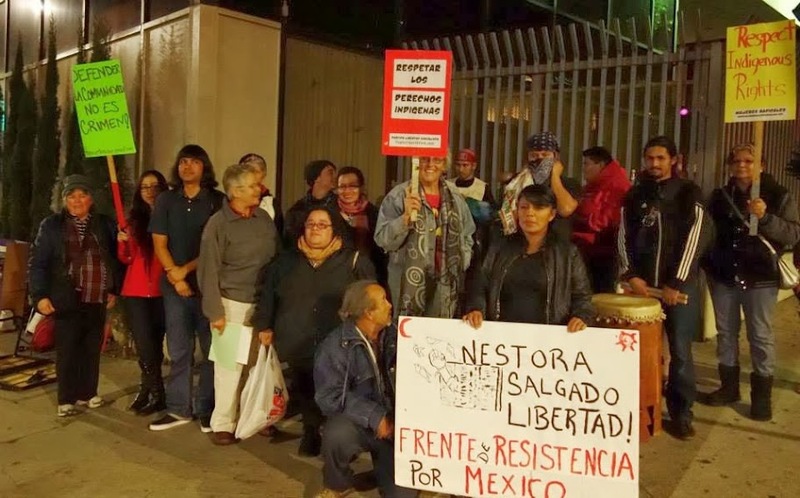 Supporters of naturalized U.S. citizen Nestora Salgado held protests at Mexican Consulates to mark International Human Rights Day on December 10, 2013. Over the last four years, Salgado, a grandmother, has made numerous trips from her residence in Renton, Washington, to deliver clothing and supplies to the desperately poor residents of her hometown of Olinalá, Guerrero. Seeing the need to organize against economic and social injustice, she instilled in the women of Olinalá confidence in their ability to lead such a struggle. As a result, she was elected coordinator of a local armed indigenous police force officially authorized by the Mexican Constitution and Guerrero state law 701. Crime rates plummeted and killings stopped with the inauguration of the community police. But, as Angie Galindo of YoSoy132 Nueva York said at a rally on the sidewalk outside New York City’s Mexican Consulate, Nestora’s “only act of defiance was exposing the connection between the government officials of Olinalá and organized crime.” On August 21, local officials retaliated by arranging Salgado’s arrest on trumped up kidnapping charges and sending her hundreds of miles away to a federal prison in Tepic, Nayarit. Since her arrest, the federal government has maintained a military occupation of Olinalá to intimidate other residents and punish those who protest Salgado’s imprisonment. Just before Thanksgiving, one of Salgado’s attorneys, Thomas Antkowiak, an Associate Law Professor at Seattle University and an expert in international human rights law, filed a petition to the United Nations Working Group on Arbitrary Detention on Ms. Salgado’s behalf. He is requesting that the Working Group declare that Ms. Salgado’s detention is unlawful and that she be freed. At the December 10 rallies, protestors presented consulate staff with letters to Enrique Peña Nieto, president of Mexico, demanding Ms. Salgado’s release and the release of other community police who are also the victims of a political witchhunt. They delivered a list of over 80 individual and organizational endorsers of the campaign to “Free Nestora.” Endorsers included: the Seattle Human Rights Commission; National Lawyers Guild; Núcleo por un Partido Revolucionario Internacionalista, Dominican Republic; Partido Obrero Socialista, Mexico; Indigenous Social Justice Association, Sydney and Melbourne, Australia; M.E.Ch.A de Portland State University, Oregon; and Central Puget Sound Carpenters Local 30. Standing outside the Seattle consulate, Ms. Salgado’s husband, José Avila, shared the story of Salgado’s work in the Olinalá community and the harsh conditions of her captivity in Mexico. Her daughter, Grisel Rodriguez, described the use of military-style torture on Nestora, including keeping bright lights on in her cell 24 hours a day to cause disorientation and sleep deprivation. Seattle Freedom Socialist Party organizer Su Docekal noted that among those calling for Salgado’s release are: Nancy Shippentower, Puyallup tribal elder; Cecile Hanson, chairwoman of the Duwamish tribe; and Moonanum James of the United American Indians of New England. Ms. Docekal compared indigenous people’s struggle against mining companies in Mexico to the struggle of Native Americans against proposed coal export terminals in the Pacific Northwest and First Nations Peoples’ fight to preserve their water and way of life in the face of hydraulic fracturing and tar sands oil extraction in Canada. Hortensia Colorado, from the Coatlicue Theatre Company in New York, is an indigenous immigrant woman from Mexico. She spoke about the Mexican government’s orchestrated plan to drive the poor and indigenous people off their land in order to hand it over to large-scale international mining corporations to extract gold, silver and other natural resources. She called it a continuation of the destruction of indigenous people and their land base that has gone on, unabated, for over 500 years. Stephen Durham spoke at the New York City rally in the name of the Committee for Revolutionary International Regroupment (CRIR). He noted that Nestora captures in her own story the international solidarity and bravery which is critical to survival, not just of indigenous people, but to the poor and working classes of Mexico, of the U.S. and throughout our hemisphere. He noted that CRIR had played a pivotal role in getting the International Human Rights Day protests off the ground in four countries. The international aspect of the gathering in New York was especially notable with the presence of attendees from Spain, Mexico, Puerto Rico and Ecuador. Calls for Salgado’s freedom were also raised as part of an International Human Rights Day speak out in Melborne, Australia. Professor Ana Fisher, a member of American Federation of Teachers Local 2121 who teaches at City College of San Francisco, spoke about how crucial women leaders are to the struggles of workers and the poor in Mexico, pointing out that they are targets of the government precisely because they are fighting the hardest. Michelle Mundt, with Occupy Portland, was struck by the democratic process of electing a community police force as opposed to one being imposed on a community by the state. In the Northwest corner of the U.S., Stop the Checkpoints, a community immigrant rights defense group in Port Angeles, Washington, held a protest on December 7 in support of Ms. Salgado’s release. Protesters there linked the struggles to defend indigenous rights in Mexico with standing up for undocumented workers in the U.S.
Marvelia Alpizar, reporter from La Opinion, and Guadalupe Lizárraga of the Los Ángeles Press attended the Los Angeles committee’s press conference and were addressed by Andy Diaz, American Indian Changing Spirits; Juan Rodriguez, Frente de Resistencia por México; Guillermo Torres, Clergy and Laity United for Economic Justice, and others. 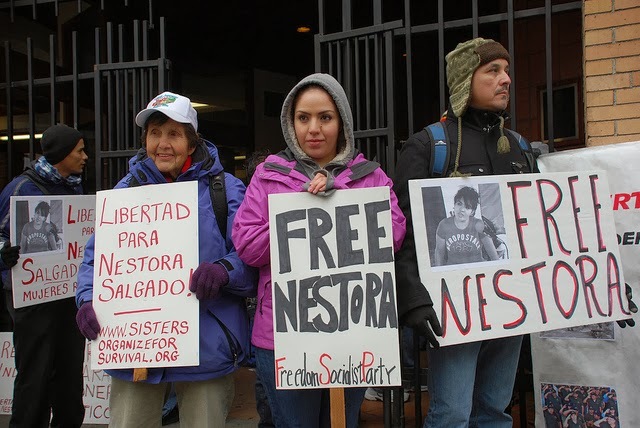 The protests were sponsored by Libertad para Nestora/Freedom for Nestora Committees in the various cities. 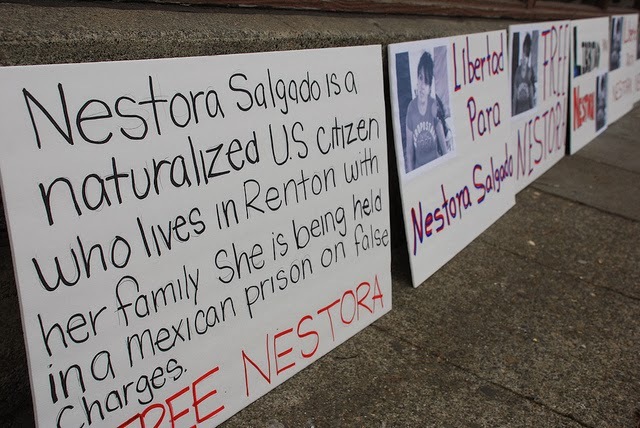 If you would like to interview a member of the Salgado family or their attorney Thomas Antkowiak, or to join the movement for Libertad para Nestora/Freedom for Nestora, please call 206-708-5161 or email FreeNestora.Seattle@gmail.com.